Tungsten (W) (atomic number 74 and atomic weight 183.92) has density of 19.3 gm/cc. Melting point of W is 3410 deg C and boiling point is 5400 deg C. The phase diagram of the Fe-W binary system is at Fig 1. Application of W in steels started as early as in the mid-19th century and until the first quarter of the 20th century, its importance in steel has steadily increased, with the steel industry then the largest W consumer. W was among the very first alloying elements systematically studied and used to improve steel properties, for example hardness, cutting efficiency and cutting speeds of tool steels. The use of W in structural steels declined since 1940 because alloying with molybdenum (Mo) and chromium (Cr) as well as with vanadium (V) and nickel (Ni) has given better performance at lower cost. W is known mainly for its strong tendency to form extremely hard and stable carbides. This property, in fact, is the basis for the most important use of W in steels, which is as a constituent of high speed and other tool steels. Around 20 – 25 % of all W produced is used in these steels. Earlier W alloyed steels were manufactured by the addition of more or less pure W powder to the liquid steel, or, alternatively, by addition of an iron rich W pre-alloy, which was obtained from purified W ore. This rather expensive procedure limited the application of W alloyed steels because of the high price. 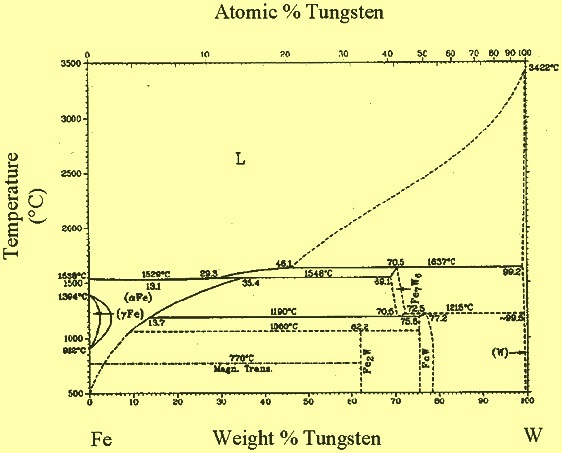 In 1893 a new tungsten ferro alloy was introduced containing up to 80 % tungsten, called ferro- tungsten (Fe-W), which was much cheaper. Fe-W has lower melting temperatures, faster dissolution in the liquid steel and a higher W yield. These days, W is also added to the liquid steel as selected W metal scrap (W content 90 % to 98 %), high speed steel scrap, or scheelite ore (CaWO4) concentrates (W content 35 % t0 70 %). Scheelite ore can be natural or synthetic. Fe-W comes in two varieties. High carbon (C) Fe-W has around 0.6 % C while low C Fe-W has C content of 0.1 % maximum. The choice of addition agent used is determined largely on the basis of steel making practice and product requirements. Economics also play an important role. W is added as scrap or Fe-W directly to the steel making furnace usually electric arc furnace(EAF) to produce liquid steel which is further refined in an AOD (argon oxygen decarburization) or VOD (vacuum oxygen decarburization) converter or a ladle furnace for adjusting the desired composition of liquid steel prior to casting. Addition of W for final adjustments in this stage is made in the form of Fe-W. Practice of addition varies as per the requirements of the steel product being made, i.e., to the aim W content, and to the availability of W containing scrap (usually high speed or tool steel). For low W alloy steels, it is simpler to melt down, take a preliminary analysis, and trim with Fe – W.
AOD process is responsible for most of the shift to scheelite use. Scheelite ore can be used directly in the AOD bath as a source of oxygen as well as W units with special precautions to avoid boil over.Addition control is better and W recoveries are usually quite high (around 90 %), no matter what is the addition practice. W losses are mainly due to mechanical reasons. One of the reasons is the extremely high density of W addition agents. For example, if large lumps of Fe-W are added to the liquid steel as a trim addition then they may sink directly to the bottom before dissolving completely. There, they may become trapped against or combined with the refractories and thus give lower or erratic recoveries. Hence good practice is to use finer product and add it slowly so that it can all dissolve before tap or teeming. It is advisable, especially if large amounts of tungsten scrap or Fe –W are added with the original scrap charge, to rabble the bath before taking a test sample or perhaps stir it up by a short argon blow. This reduces the gravity segregation (stratification) of W towards the furnace bottom and gives a more representative or at least more reliable sample. W has a tendency to stick to furnace bottom refractories or be partially absorbed by them. For this reason a ‘reversion of W’ may occur when making a non W bearing heat after a series of heats with W additions in the melting furnace. High W steels such as high speed steels are extremely susceptible to segregation during casting. High amount of hot work (usually 90 %) is needed to break up this segregation and provide for a uniform structure in the final steel product. Since the early days of tool steel, W addition has remained a synonym for improving the high temperature properties of steel, in particular hot hardness, resistance to plastic deformation and wear at high temperatures. W produces stable carbides and refines grain size so as to increase hardness, particularly at high temperatures. W enhances cutting efficiency and speed of tools. When added to steel, W forms tungsten carbides or complex carbides with other carbide forming elements, such as Cr, Mo, V, and also iron (Fe). It increases the amount of undissolved and excess carbide in the hardened steel, and the eutectoid point is shifted towards lower C concentrations. The consequence is the precipitation of fine or very fine grained carbides evenly distributed in the steel matrix. The chemistry of these carbides depends on the concentration of carbon and the alloying elements present as well as on the heat treatment applied. Complex carbides are responsible for retaining a fine grained steel matrix by retarding the grain growth during heat treatment. The addition of W produces a larger carbide volume than other alloying elements at the same C level. Good wear resistance is the most important property of tool steels, and W, next to V, is the most effective carbide forming element for increasing wear resistance. Further, W significantly improves the hot hardness and hot strength of steel and leads to increased yield strength and tensile strength without adversely affecting ductility and fracture toughness. The effects of W on steel properties in terms of carbide volume, shape and distribution, and fine grained structure are as follows. The high hot and red hardness (which is the retention of hot hardness over long term exposure to high temperatures) and the high hot strength are the result of a microstructure containing numerous high-alloy carbides of a composition that enables precipitation hardening by age resistant carbides and solid solution strengthening. In some low C steels, as, for example, in case of creep resistant martensitic Cr Steels, precipitation strengthening by inter metallic phases occurs during creep exposure, such as Laves phases [Fe2(Mo,W)]. The behaviour of W during heat treatment follows the same pattern as other strong carbide forming elements. It stabilizes ferrite, being stronger than Cr in this respect. It has an inherently high hardenability factor, but the net effect of large W additions is mainly to decrease hardenability due to the removal of C from solution by the formation of stable W carbides and the subsequent grain refining action these carbides provide. W raises both the eutectoid temperature and the A3 temperature. Thus, W steels needs higher austenitizing temperatures. W decreases the eutectoid C content (a minimum of around 0.2 % C occurs at a W content of 5 %). There is a slight increase in eutectoid C content as W content is raised above this level. W decreases the Ms temperature but, again, the situation is complicated by the presence of stable carbides. In case of dissolution of these carbides being incomplete, as with too low austenitizing temperatures, the MS temperature may actually appear to be raised by W additions. W steels show a definite secondary hardening peak upon tempering. This phenomenon is an important contribution to the high hot hardness for which high speed steels are known. For the heat treatment of W type (T-series) high speed steels, precautions regarding slow heating, dwell periods at specified temperatures and the avoidance of incipient melting is to be observed. W grades are less susceptible to decarburization than Mo high speed steels, but heat treatment temperatures are somewhat higher and chances of ‘burning’ of the steel by overheating is increased. W steels are preheated at 815 deg C to 870 deg C and austenitized in the range 1260 deg C to1300 deg C. Refrigeration and double tempering are the recommended procedure for the transformation of residual austenite. Main use of W as a constituent of steels is in applications requiring the wear resistance and hot hardness imparted by tungsten carbides. This includes most, though not all, of the standard tool and die-steels as well as the W- and W-Mo high speed steels. Tool steels are used for hot and cold forming and for cutting of materials, particularly other metals, wood or polymers. This presumes that their strength and hardness must exceed that of the materials being cut or shaped. Tool steels are usually classified into the following four groups. Plastic mould steels, with W content of around 1 %. Besides tool steels the increasing use of duplex steels for corrosion resistant applications in offshore oil and gas production as well as that of creep resistant 9 % to 12 % Cr steels for power generation is still an interesting and increasing market for W, where the element has a strongly positive effect on the microstructure stability.